The buying and selling of art – especially contemporary art – has been in the news a lot lately. In May, Christie’s sold over $1 billion of art in just three days. Rival Sotheby’s did well too; its 63 lots of contemporary American art sold for an average of over $6 million each, totaling over $380 million. In 2014, charitable giving to nonprofit organizations in the arts, culture, and humanities sector reached a total of $17.23 billion – a total of 5 percent of all donations received by charities in 2014, according to Giving USA 2015: The Annual Report on Philanthropy. When assessing charitable giving to the arts, culture, and humanities sector these past few years, we are seeing that there is a steady growth in contributions. 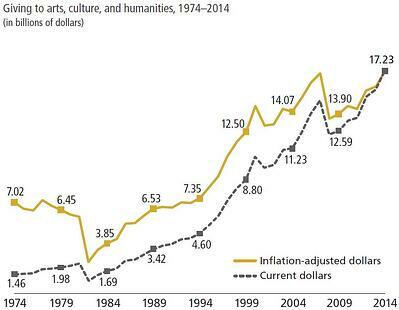 Between the years of 2013 and 2014, giving to arts, culture, and humanities increased by 9.2 percent. Below are some key findings and recommendations that are intended to help organizations in the arts, culture and humanities sector effectively prepare for their future in fundraising. For years, nonprofit organizations have motivated high-capacity donors to make leadership gifts by leveraging physical spaces or prestigious endowed positions as naming opportunities, especially during capital and/or endowment campaigns. 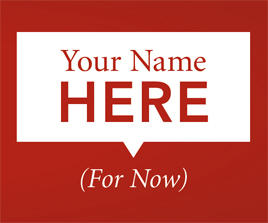 Historically, these naming rights have been offered in perpetuity, with the legacy of a one-time gift often outlasting a supporter’s relationship to an organization – or outlasting the useful purpose of a space or building altogether. In the world of memes, mashups, popups and flash mobs, is there still a place for the traditional cultural arts? A panel convened to discuss that for Campbell & Company’s recent webinar, The Future of the Arts: Strategies for Sustainability. Joining the discussion were Robert Alpaugh, Senior Consultant at Campbell & Company; Carroll Joynes, Co-Founder and Director of the Cultural Policy Center, Harris School of Public Policy at the University of Chicago; and Ben Cameron, Program Director of the Arts at the Doris Duke Charitable Foundation. In the May-June edition of the American Associations of Museums' (AAM) MUSEUM, author Carl G. Hamm, Deputy Director, Development and External Affairs at Saint Louis Art Museum, and immediate past chair, AAM DAM, discusses the high turnover rate among museums' chief development officers and the lack of quality chief development officer candidates. According to a recent study conducted by a national consulting firm, the top development post at more than 25 percent of the art museums holding membership in the Association of Art Museum Directors (AAMD) were either vacant or in the process of being hired. Additionally, the survey revealed that the average tenure of a chief development officer with an organization is 18 to 24 months. As a result, the development position in museums is becoming a "short-term enterprise rather than a strategic institution function". Projects for speedy fund generation as apposed to a long-term sustainable philanthropic-driven program development. Unrealistic expectation of raising a big sum of funds in a short time frame. Exclusion of accomplished mid-level professionals in grant writing, event management, gift officers, planned giving specialists, membership managers, and campaign managers from the organization’s overall budgeting discussions. Differentiation between programs designed to generate fast cash and those philanthropic relationships that sustain organizations in the long term. A better understanding of the role philanthropy plays in the life of the organization. Willingness to generate earned revenues in a more innovative and entrepreneurial way. Establishment of realistic expectations from the new chief development officer to produce successful programs. Inclusion of mid-level talent into the discussions about the ongoing matters of the organization. Encouragement of the continuous professional growth among aspiring professionals. Also, Mr. Hamm warns against eroding from the philanthropic culture, which is essential to the museum field and encourages addressing the issue of qualified high level development professionals properly and promptly. For questions about how to retain your top talent, contact Marian Alexander DeBerry. Campbell & Company is a national consulting firm offering advancement planning, fundraising, marketing communications and executive search services to nonprofit organizations in nearly every sector. Through thirty-six years and more than a thousand engagements, we helped our clients anticipate and manage the challenges of the philanthropic marketplace. Our offices are located in Chicago, Boston, Portland, Los Angeles, the San Francisco Bay Area and Washington, DC. For more information, please call toll-free (877) 957-0000, email info@campbellcompany.com or visitwww.campbellcompany.com.